Who needs 57 ingredients in their ketchup? 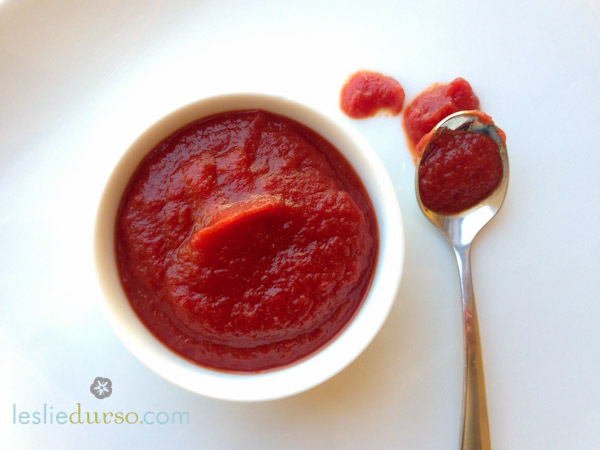 Making ketchup is way easier than you think! And how cool will you look at your Summer BBQ’s by saying, “Try some of my homemade ketchup on your veggie burger”? This ketchup is also the base of a lot of my sauces I’ll be talking about in the next few weeks so it’s great to have on hand. Whisk all the ingredients together in a pot and heat on medium until it bubbles, reduce heat to low and let simmer for 15-20 minutes stirring regularly. Refrigerate and serve chilled. *Make sure you buy a tomato paste where the only ingredient is “tomatoes”. You don’t want all that other chemical stuff! Such clean ingredients… love it! Back-to-Basics! Learn to make homemade ketchup! http://t.co/pD3N2MTjWN so much healthier for you! Yum – I will try this! Do you think you could use brown sugar or maple syrup instead? Lynn, I would do a combo. Maybe half brown sugar, half maple syrup. I think full of either would be too much 😉 Let me know how it turns out! Cool…but Heinz ketchup does not have 57 ingredients.